The cooler weather is upon us and I got to have play at work. Quince is only available in the cooler months so I thought I would try a using it in a crumble. My previous encounters with quince has mainly been quince paste with cheese. Maybe next year I will have a go at making some as I have a recipe in either Maggie Beer’s cookbooks or Stephanie Alexander’s book. I have never cooked quince before so after a bit of research I found bizzylizzysgoodthings.com with a recipe for slow cooked quinces. I also had an inkling to make some salted caramel icecream to go with the crumbles, so a bit more research and I found a recipe on David Lebovitz’ website, davidlebovitz.com. Time to get cooking. The quince was easy and took about three hours to cook. Next time I think I would use a little more water as the syrup became very thick, but I got the fruit to a beautiful deep red colour. 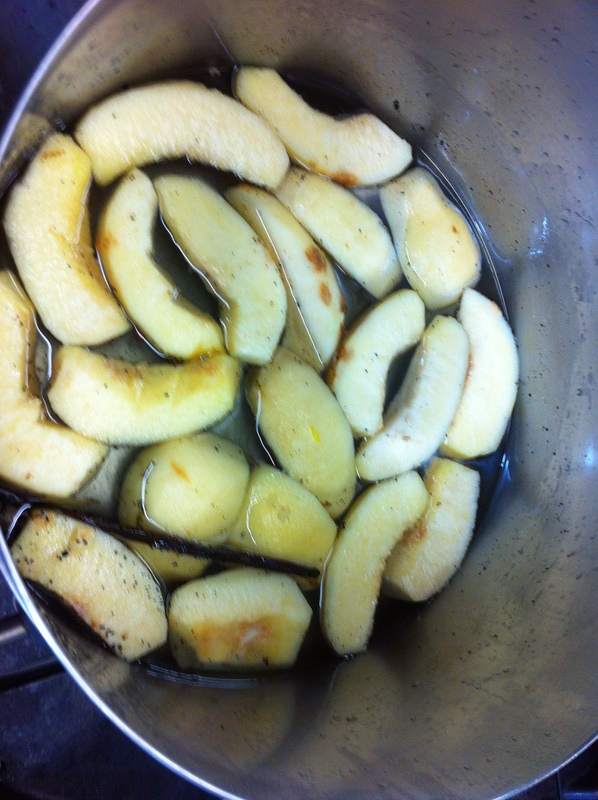 I poached the pears simply in a little sugar syrup until cooked but still firm. The pears were Williams which were firm and great for cooking. I then diced the pears and quince, mixed them together, divided the mix in to ramekins with some syrup. I added the pear liquid to the thick quince syrup and this loosened it up nicely. 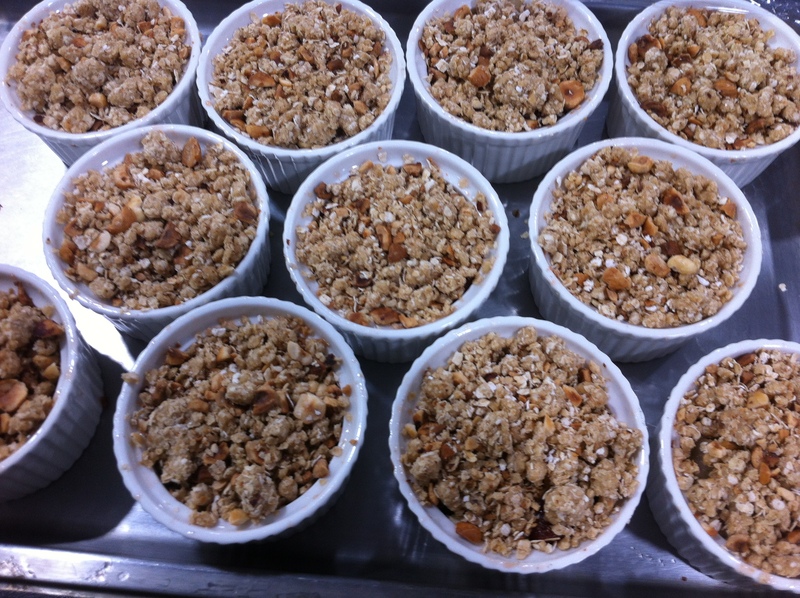 In our family our crumble topping always has rolled oats. I cream butter and brown sugar together, mix in some flour and then the rolled oats. For this crumble topping I also lightly toasted some hazelnuts, removed the skin and broke them up a little. I then added the nuts to the crumble mix and sprinkled the mixture over the fruit. Quince and pear crumbles ready for the oven. To reheat them I preheated a fan forced oven to 180C and cooked them for about 20 minutes until they were hot. For the icecream I just followed the recipe on David Lebovitz’s site. The ice cream and the crumble together were a taste sensation!! 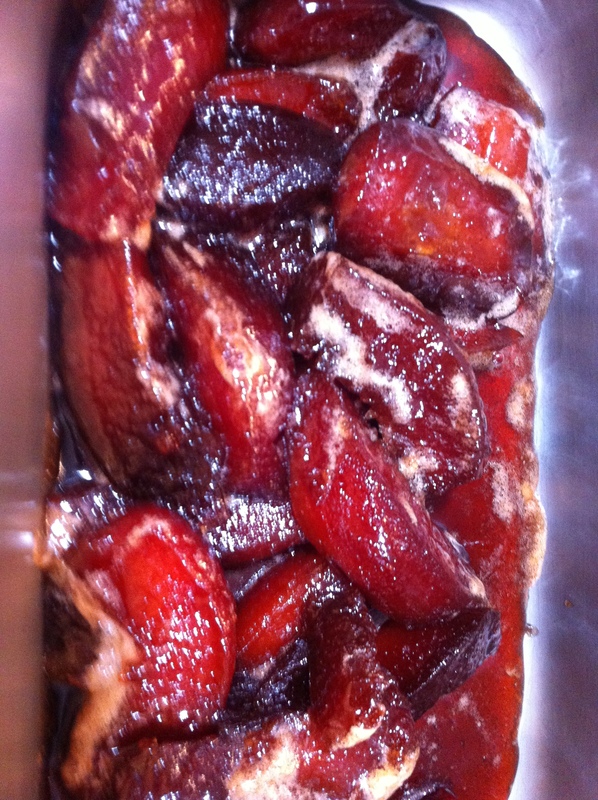 Looks like I will be preserving some quince this week ahead of using them for an upcoming wine dinner in September. Our GM loved the crumble and the salted caramel ice cream so much that she really wanted to use it for one of the wine dinners. The next wine dinner was already sorted so we get to do the crumble on the one after. 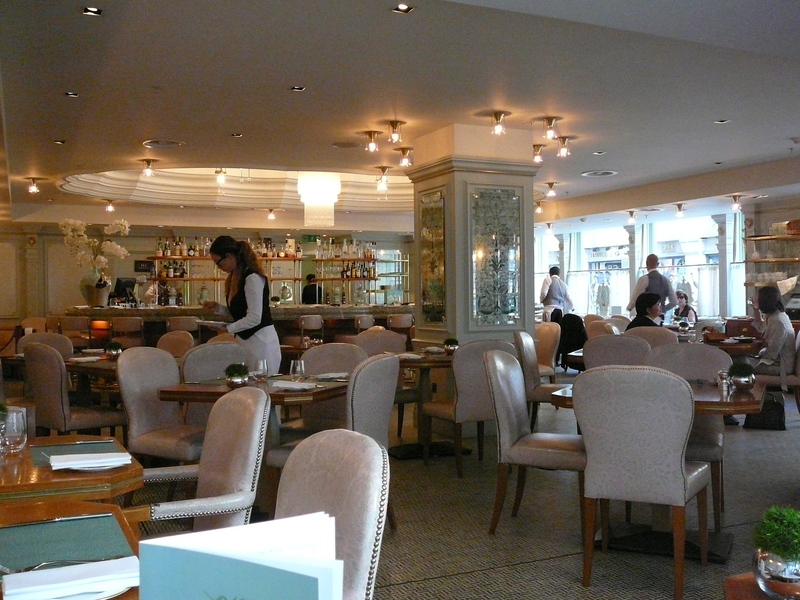 During our trip to London last year we had a walk to Knightsbridge for lunch. As we were early we had time for a quick visit to Harrods. Talk about busy. Obviously it is now a huge tourist destination and not just a department store, so there were lots of tourists mixed in with the locals. 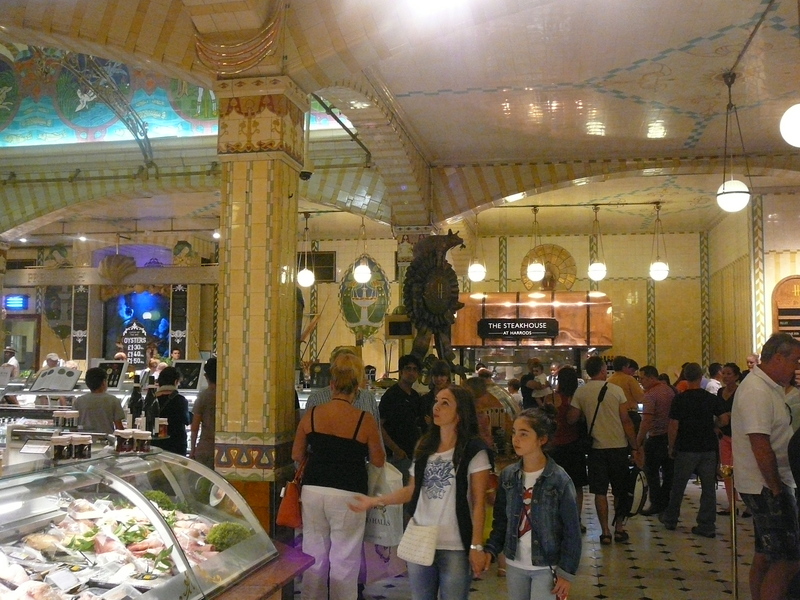 As it was so busy we only did the ground floor which also included the food hall. 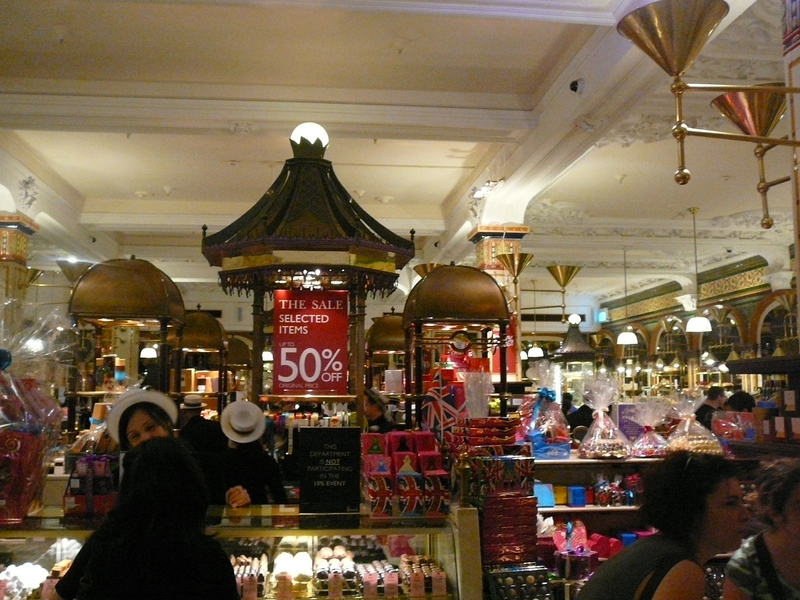 I remember watching the mini series A Woman Of Substance waaaaay back in the 1980’s and Harrods was used for Harte’s. So I finally got to see the real thing. 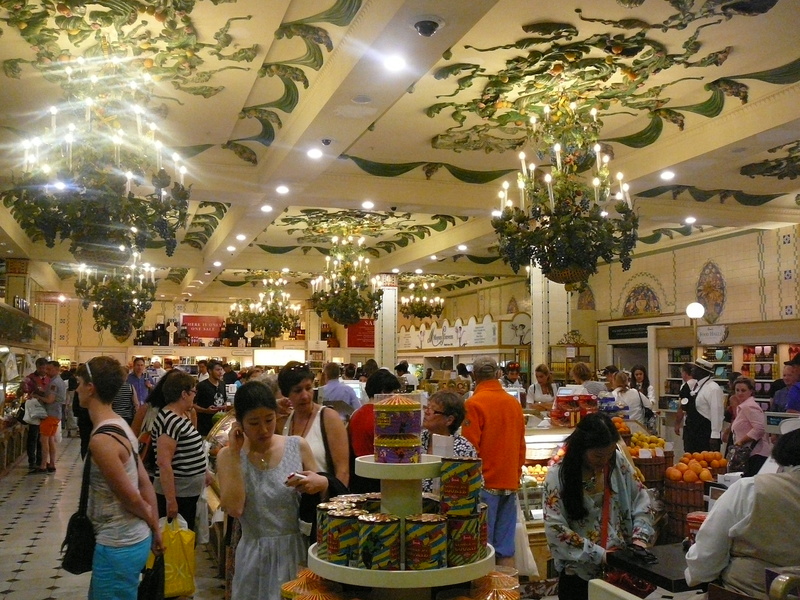 I have to say the food halls are amazing. So many original architectural details are retained. 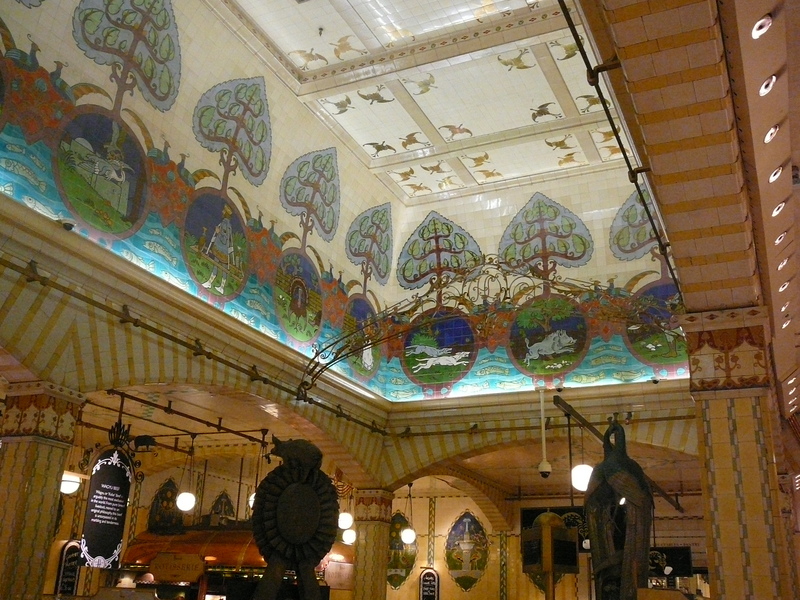 Each hall has a theme and tiles, painting and decor all represent what is being sold in the area of the hall. Of course I saved the best till last. 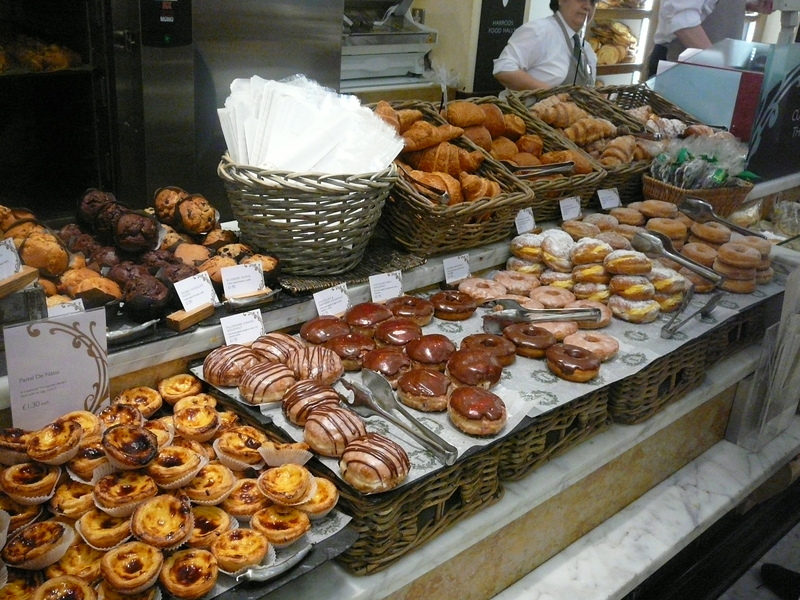 The Bakery OMG I think there were 16 types of donuts, about the same of croissant variations and just a mind boggling selection of breads. 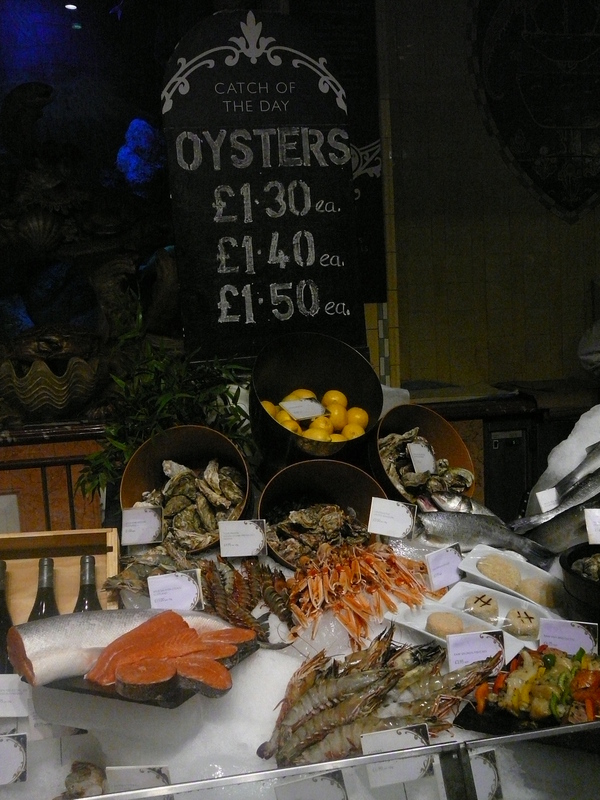 But we didn’t try as it was just before lunch and we didn’t want to ruin our appetites. Of course we also stopped in to the wine department. WOW such an amazing selection of wines from all corners of the world. I was particularly interested in identifying wines from Burgundy that I had heard of, and checking out what Bourdeaux wines they had. 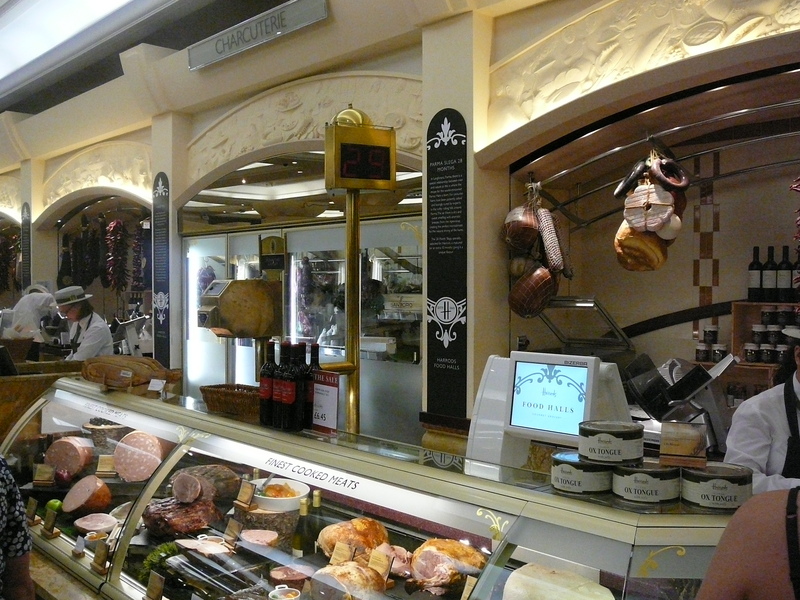 Sadly no photos of the wines, but if you are ever in London make sure you head to Harrods. 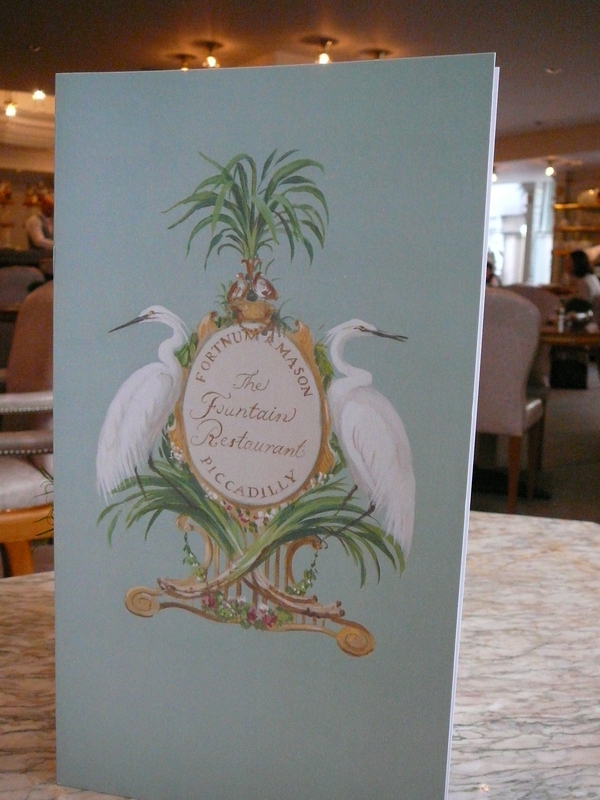 Wandering around Piccadilly late one afternoon, we decided to have an early dinner and picked The Fountain Restaurant, in Fortnum and Mason. 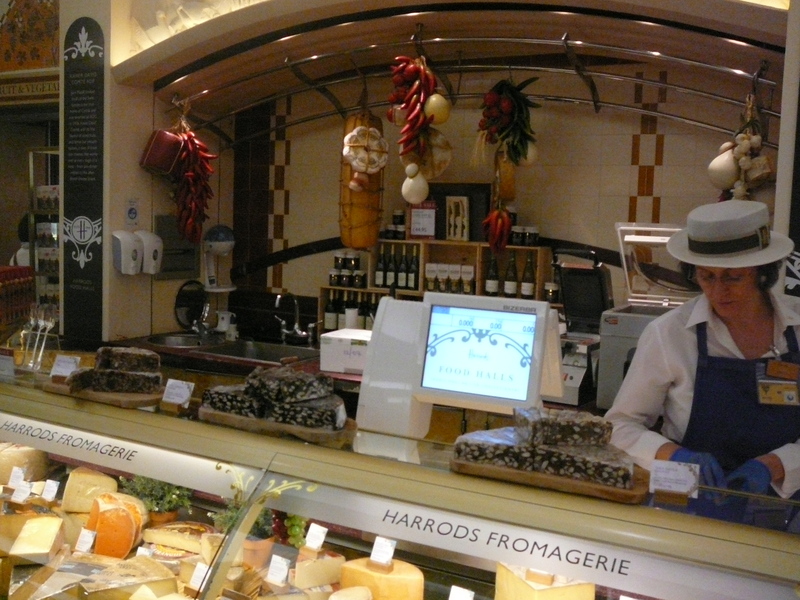 With a 300 year history, Fortnum and Mason have been supplying Londoners (and visitors) with a high quality selection of fresh produce, prepared food items and luxury goods of all descriptions. Mr CA4G had lunch here way back in 2007 when on a business trip so we had to go so I could experience it. Wonderful attentive service, beautiful elegant room with lots of soothing pastel colours, crystal and mirrors. Furnishings were in medium woods with chairs in cream leather. Mr. CA4G had beer battered fish and chips , which from memory was haddock. It was huge, didn’t even fit on the plate it was so long. 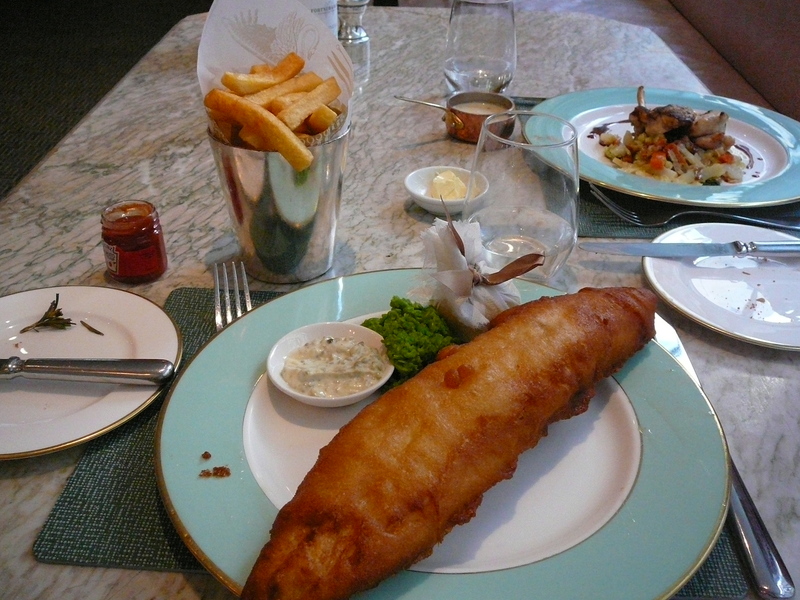 The chips came ina Silver plated tumbler, mushy peas, tartare sauce and muslin wrapped lemon were on the plate. I had a roasted chicken breast with bread sauce. 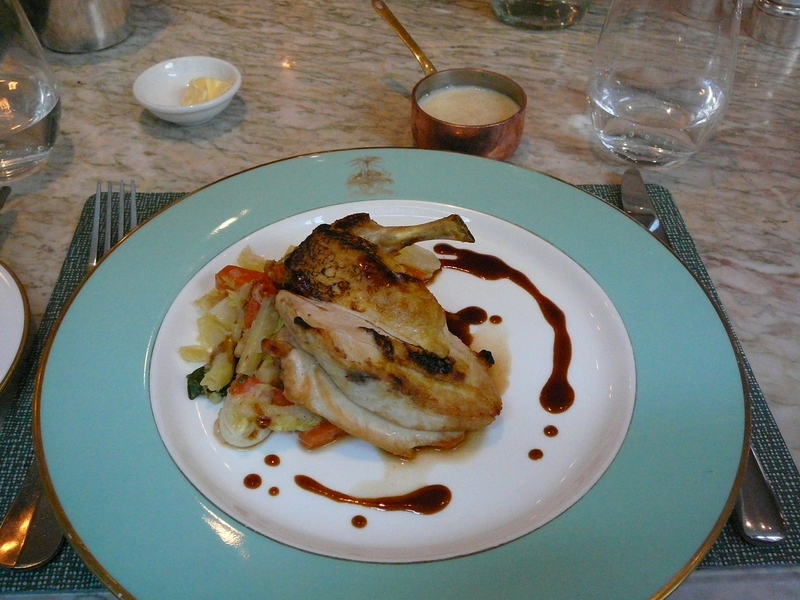 Now it was fancy chicken breast as the growing location was specified on the menu, but silly me forgot to note it down. it was however very delicious and moist, and I enjoyed my first try of bread sauce. 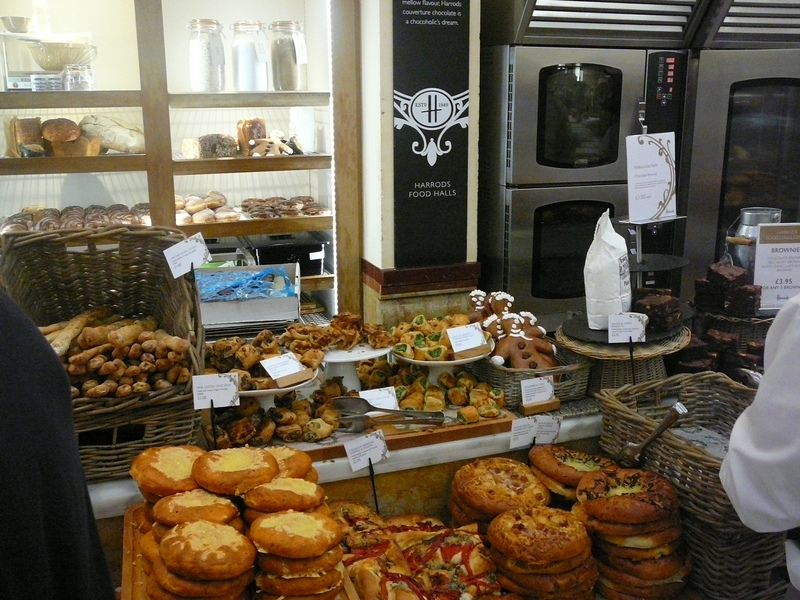 Next time we visit London we will definitely head back to both Harrods and Fortnum and Mason for a better look around. A bit of family tradition I have missed over the years was the Easter Cake. 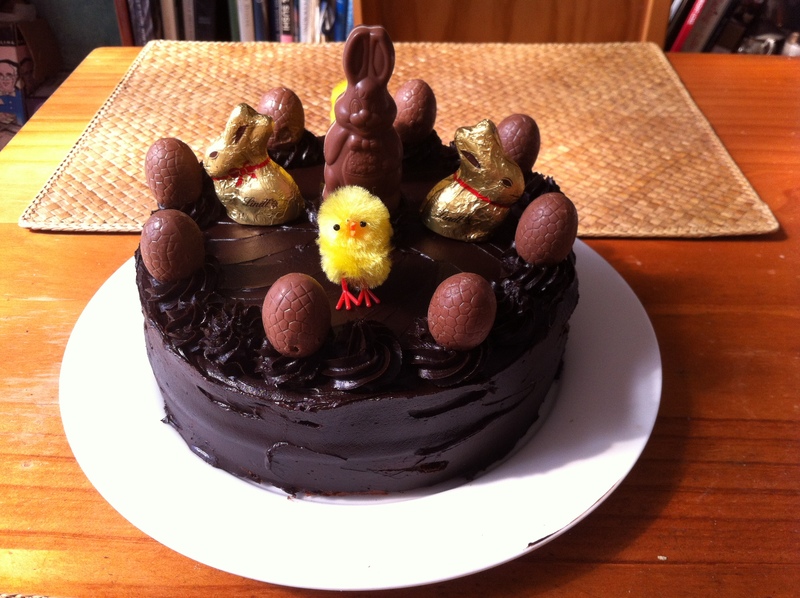 Each year Mum would make a cake and decorate it with chocolate eggs and little fluffy chickens. While shopping before Easter I stumbled upon the fluffy chickens and decided to bake a cake. I was being a bit lazy so bought a cake mix, Devils Food Cake from Duncan Hines. Al lthe measurement were in Imperial so I had to do a little conversion before starting the cake. I was happy with the result of the cake. I also made a ganache to ice it using Lindt 70% dark chocolate and thick cream( the type you dollop and is 45%fat). So rich and practically set just sitting on the bench. Along with the fluffy chooks, I also finished it with Kinder bunnies, Lindt bunnies and caramello eggs(too sweet). As there was only myself and Mr. CA4G at home, I took the rest of the cake in to work and shared it around. Mr CA4G’s Easter eggs are still uneaten, I think the amount of chocolate in his two slices of cake was sufficient for 3 months. Do you have a family Easter tradition? I was feeling like cooking something a little more special for dinner on a recent day off so decided to do a two course dinner for Mr. CA4G and myself. 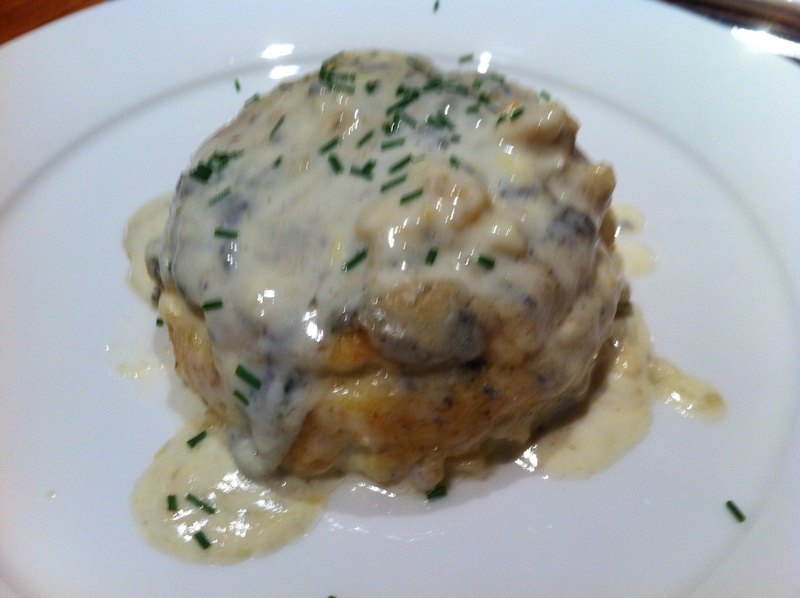 Had a cauliflower in the fridge so I knew I wanted to do a cauliflower souffle with a blue cheese sauce. That sorted out the entree. 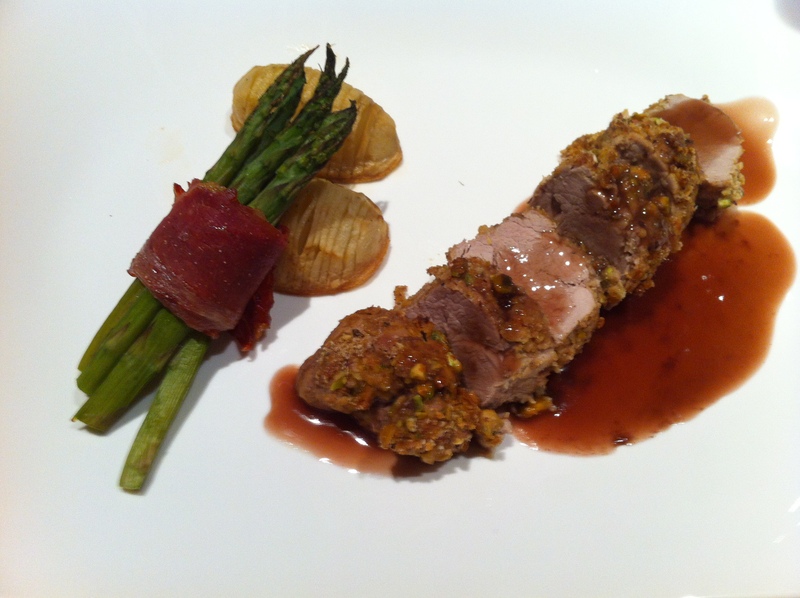 I also wanted to tweak the pistachio crust for our upcoming wine dinner at work, so decided to crust a pork fillet with it, along with Hasselback potatoes and asparagus wrapped in Jamon Serrano. Just a quick sauce of reduced stock with a French Merlot that happened to be open. The asparagus wrapped in jamon is nice and easy to do and makes a fancy accompaniment to a meal. simply trim your asparagus, lightly cook and then refresh in iced water. Remove once chilled and the dry on paper towel. 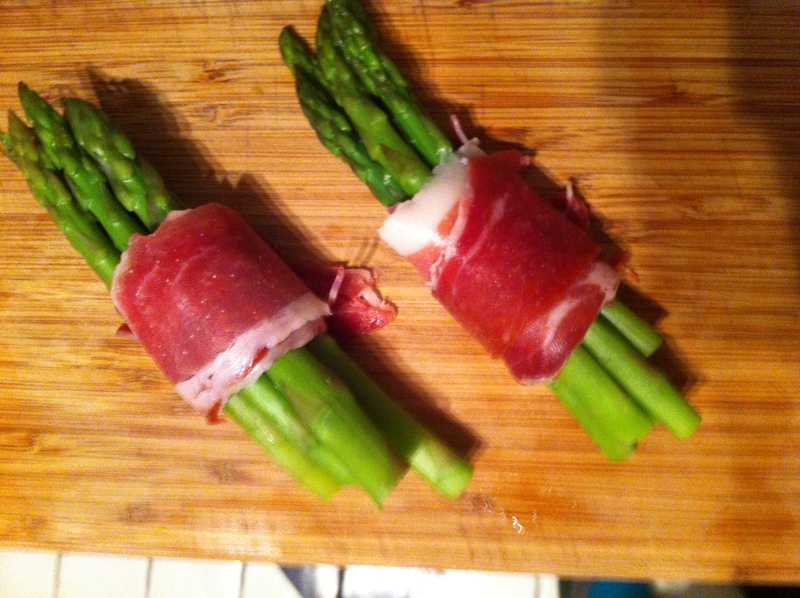 Lay your slice of jamon (or proscuitto) out fold in half along the length, place asparagus at one end and roll tightly. Place on lightly greased oven tray and bake until jamon crisps up and asparagus is hot. My rolls had 6 spears in them. Sometimes a little treat of a two course meal at home is called for and this hit the spot.